The F-35 Lightning II is the future of air power. A fifth generation fighter, the F-35 is a multirole aircraft designed for air-to-air, air-to-ground, electronic attack and intelligence, surveillance and reconnaissance missions. As one of the most advanced strike aircraft in existence, the F-35 is being built for the battlefield challenges of the future. There are three variants of the aircraft, each designed for the operational challenges of different services: the Air Force’s F-35A – conventional takeoff and landing variant, the Marine Corps’ F-35B short takeoff and vertical landing variant and the Navy’s F-35C carrier-based variant. Harris technology plays a critical role on each one of them and will ensure that U.S. and allied pilots continue to dominate the skies. Harris has been working with F-35 industry partners from the program’s inception through the aircraft’s first deployment in 2015 and will continue to support it into its operational life. Harris provides the F-35 with cockpit communications, data processing, sophisticated avionics and electronic warfare technology, as well as clean, pneumatic carriage and release racks that support the aircraft’s low observable profile. Communication, navigation and instrumentation antennas deliver situational awareness while advanced datalink protocols ensure data remains encrypted and secure. Harris avionics infrastructure and electronics are critical to providing more efficient, affordable and higher-performance capabilities than ever before, in keeping with the F-35’s status as the next generation standard bearer of U.S. global air power. 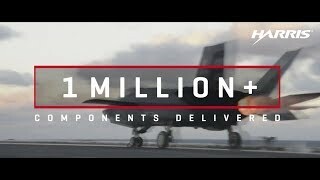 Harris Corporation has delivered more than one million avionics components to Lockheed Martin for the F-35 Lightning II, while significantly cutting costs and maintaining a near perfect on-time delivery record.